I’ve been trying to find the time to sit down and write out my weekend, and here it is almost Thursday. I’ve been distracted this week with filling out a mountain of paperwork for Jafta’s kindergarten application. How in the world do I have a child old enough to go to kindergarten? Jafta got to have a look at the school today and he said as we were leaving, “I think this place is going to be very positive for me“. I really hope so. This past weekend was quite a big one for me, given that my usual weekend involves fighting over my Netflix choices with Mark, popping fat-free popcorn and then falling asleep halfway through a movie. Somehow a flurry of fun activities converged over one weekend, starting with the Dwell Design show on Friday. If you are not familar with Dwell, it’s a design magazine full of beautiful homes and the morose people who live in them. I’ve been a fan for a long time, so I was thrilled when I got an invitation to go to their show as a blogger. We were also treated to a nice lunch, where I found myself seated between the writers for Apartment Therapy and Daily Thread as the editor of Dwell introduced us to Vivienne Tam’s computers for HP, and Heath Ceramic’s newest designs. I sat there trying to fit in and act in-the-know, all the while wondering what junior PR rep accidentally sent me an invitation to this soiree. I was clearly outside of my typical genre of self-incriminating poop stories. I must confess to some oddly conflicting feelings about home design. It is something I used to be incredibly passionate about. I used to love design – before kids I spent most weekends plotting how to artfully arrange things in my house. I’ve often felt regret over not going to design school, and there was a day when Metropolitan Home and Elle Decor graced the coffee table instead of Goodnight Moon and the latest catalog from Right Start. But a few years ago, I had a shift in values, and started feeling like design (along with many other things in my life) was just a useless luxury – a passion that cost money, that led to envy and discontent, and that illustrated some shallow attempt at creating external beauty with objects instead of relationship. (And also, who has time to shop for pretty things with four kids in tow? Four kids who are probably going to smear peanut butter all over whatever pretty thing you buy, anyway). I become ambivalent about design. I appreciated it, but it also annoyed me. Especially as I started reading more and more blogs of mothers who photographed their crafts, their living room tableaus, and their whimsical nurseries. It all seemed so show-y and competitive and meaningless. Especially in light of everything going on in the world. This expo, though, sort of awakened the giant within, and I found myself enthralled, and also a little wistful of this art-loving side of me that I’ve suppressed and demonized. And I found myself having a little existential moment – on the one hand, wary of how materialistic I’ve been in the past, but also suspecting that perhaps some of my “denial of design” was really coming from a place of inner frustration . . . frustration that I don’t have the time or energy to care, so it’s easier to pretend I don’t. I mean, yes, I think it’s good to be aware of how I’m spending my money and energy, and make sure I’m putting the majority of those resources into people and not things. But at the same time, there is something to be said for indulging in creativity, and finding a little satisfaction in the aesthetic. And this doesn’t need to cost me a lot of money – my friend Julie is a great example of that. I think there is also a part of me that is so bogged down by the reality of global human suffering that I’ve become a little masochistic with myself. As if I’m somehow helping by refusing to indulge in a creative outlet. When, in fact, I need to figure out to be a happy, joyful person for the four kids I live with, and a part of that might include some frivolous passions over mid-century furniture. Or chalkboard paint. Or whatever. Not to mention, the Dwell show was full of great ideas for going green. 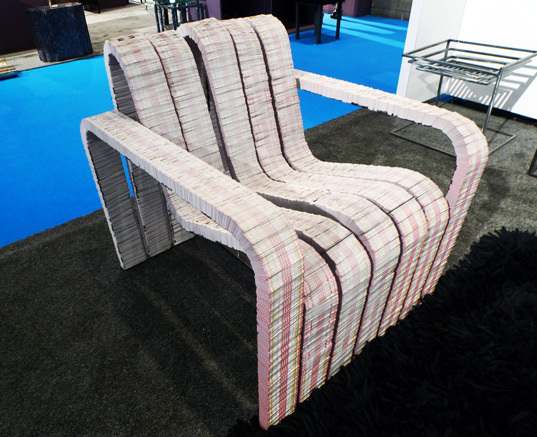 This chair is made from 350 old decks of playing cards . I mean, this chair is PRACTICALLY SAVING THE PLANET. And leaving wicked indents in the back of your thighs. For only $5000. Anyways, ahem. Yes. Iif you are still reading . . . I guess I’ll get to the flashmob portion of my weekend later. But until then, I’ll say this: the flashmob was all that I hoped it could be, and more. And a great illustration that art can bring great joy, to both the participant and the observer. As the youtube clips went up, I watched with amusement as one spectator started filming and squealed with glee like a little boy on Christmas morning as we broke into the choreography and he realized what was going on. There’s something really beautiful about that. And also, I’d like this in my backyard. This is the footage that my friend Moya’s husband got with my camera. I’m in the bottom right-hand corner in the green jacket and white tank. Moya is in yellow (she’s the really, really good one). I’ll post the official (and nicely edited) flashmob video tomorrow.